Mr. Stemler got his photo order on Thursday. Did you? Ms. Warkentin leads a FreshGrade learning session on October 24. Super turnout for the October 20 PAC Meeting. Beautifully painted walls. District Facilities staff discuss the importance of priming before painting to curious Cambridge learners. Cambridge leaders attend WE DAY at Rogers Arena on October 22 and learn to be the change they wish to see in the world. At Cambridge, we all lend a hand. Love the wonder and awe captured in this photo. Can you spot the two ladybugs these Cambridge learners are caring for? New cozy reading space in the Library. Truth: Each of us is unique! How to be a Cambridge STAR! Traffic Safety is a hot topic in most school communities and Cambridge is no different. The feedback we are receiving is that many parents are becoming frustrated that the DROP OFF ZONE is not being used appropriately. School staff is noticing the same thing. One thing is clear – school staff want to spend their supervision time making sure students and parents are safe and welcoming them to school, not playing the role of bylaw officers. We expect ALL Cambridge community members, students, staff, and parents to be STARs: SAFE, THOUGHTFUL, ACCOUNTABLE, RESPECTFUL. We know that if we are all of these at all times, many problems will be avoided. WALK! It takes a little longer, but every time you walk, it means one less vehicle in the school driveway. When dropping off, encourage older siblings to walk younger siblings to class. This way, parents do not need to leave their vehicles. 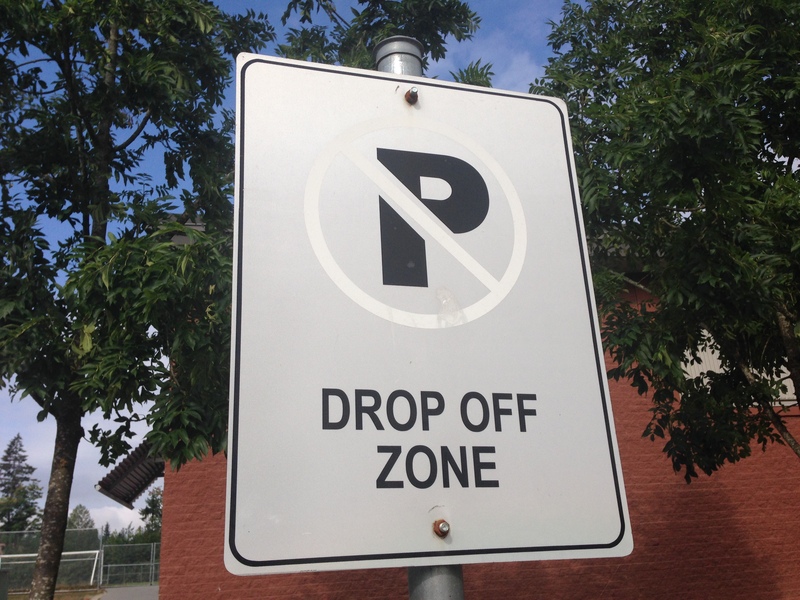 Stay with your vehicle in the DROP OFF ZONE. Remember that the school driveway is a fire lane and emergency vehicles need access to this area at all times. Drop your child off at school a little earlier. We’ve noticed that many vehicles are arriving at school at the same time, causing congestion. If your child is older, feel free to drop them off at school starting at 8:15 a.m as this is when supervision begins. If your child is in Kindergarten, arrive closer to the welcome bell – 8:33 a.m.
Mostly, be patient with school staff and each other. Remember…we are all part of the same team! Our PAC-sponsored Halloween was a great success. A special thanks to our harding working PAC members who not only spent the entire day creating a wonderful environment in the gym, but also did a tremendous amount of pre-planning. The turnout was great! The view from the DJ’s booth. DJ Paul at the Halloween Dance. Ms. Vogstad snaps a photo at the Halloween Dance. Dinner time at the Halloween Dance. Our primary students will participate in a costume parade AFTER LUNCH in the gym. Parents are welcome! Parents, please park strollers outside or on the stage area, and please view from the stage area or the designated area in the middle of the gym. Please be mindful of parents behind you wanting to take photos of their own little ones. Students are welcome to wear costumes. Weapons or ANY KIND, real or replica, are not permitted as per District Policy. Masks are permitted during the school day, but should not be worn outside at recess or lunch. Costumes should not depict blood or gore. Remember that our youngest learners or still 4 and 5 years old and may be frightened by some of the more mature costumes. We want Halloween to be fun for everyone! Volleyball season is in full swing and both our boys and girls teams have been practicing hard to prepare for their first games. We are fortunate that there are many staff members willing and able to coach again this year. We know that many school activities would not be possible with this support, so THANK YOU to Mr. Dewar and Mr. Kwon, girls team coaches, and Ms. Minhas and Ms. Vogstad, boys team coaches. Wednesday, October 22 was a great day of authentic learning. About 20 Grade 6 students had the privilege to attend WE DAY 2014 at Rogers Arena in Vancouver with Ms. Burwash and Ms. Young. WE DAY is an inspirational event held annually that calls youth to take action on local and global issues. We look forward to hearing about the meaningful work our student leaders will do to bring positive change to their world! We were most impressed with how engaged and focused learners were, even with minimal supervision. Most students actually continued to work through their recess and lunch! Enjoy this video that shares the experience from beginning to end…in 60 seconds! Emergency Preparedness was a big topic discussed at the PAC meeting on October 20th. As a community, we acknowledge the need to make significant improvements in this area. Special thanks to parent Garth Hutchison who has done a tremendous amount of work in researching products and costs for preparedness material. Cambridge PAC passed a motion to allocate funds towards the purchase of 30 emergency kits – one for each classroom and learning space (gym, library, music portable, and french portable). In addition, water and food rations will also be purchased for storage. This purchase is part of a multi-year plan to raise our school’s level of emergency preparedness. Later this school year, we plan to implement an EMERGENCY DISMISSAL event whereby students are picked up from the grass field following an emergency drill. Much more information will be communicated about this in the coming months. In future years, we will extend the water and food rations from 24, to 48, and then to 72 hours, as well as begin the purchase of both search and rescue supplies as well as shelter and sanitation equipment. Thank you to our Cambridge PAC for this declarative commitment to the safety of our students and staff! VIDEO OF THE WEEK: WHAT IS 21ST CENTURY EDUCATION? By change, we mean curriculum being less focused on CONTENT and more focused on COMPETENCIES. The video below communicates how quickly the world is changing, as well as what we know about it. Learners today need to possess a myriad of skills such as strong communication skills, critical thinking and problem solving, and self and cultural awareness. Read more about these curriculum changes BY CLICKING HERE! 31-Halloween-Primary costume parade AFTER LUNCH in the gym. Parents please visit! 7-Remembrance Day Assembly – 9:00 a.m.
24-PAC Meeting – 9:00 a.m.
16-Parent Teacher Conferences – Early Dismissal – 1:30 p.m.
17-Parent Teacher Conferences – Early Dismissal – 1:30 p.m.